We invite you to come and explore the small, beautiful, natural islands located off the southeast coast of Bali. We depart from Sanur around 9 am by fast boat, across the sea of Bali to the islands of Nusa Penida and Nusa Lembongan. Along the way you will be enchanted by the scenic beauty of the islands from the sea. 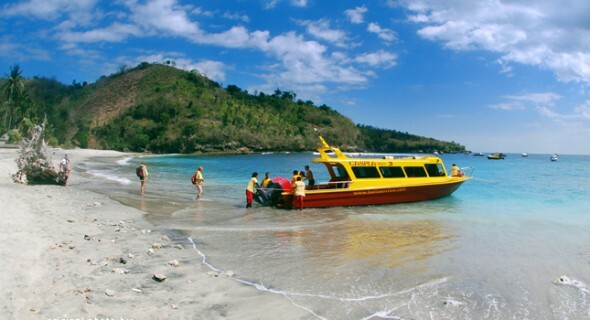 Our first stop will be Manta point which is located on the south island of Nusa Penida. Here we will see the very large and majestic manta rays. If we are lucky we will also see dolphins dancing in the sea. After that we will continue our island exploration at Crystal Bay Beach. Here you can enjoy the beautiful view of the beach, hills, the bay and clear water which is perfect for snorkeling and cooling off. Our next stop is Gamat Bay which is famous for its marine life, colorful coral and very friendly fishes. We will snorkel here and feed the fish, where they will eat right out of your hand! After this we will return to the north of the island of Nusa Penida for lunch at a beachside restaurant which specializes in freshly grilled fish. Here you can relax, refresh yourself and enjoy the beautiful view of Mount Agung (the biggest mountain in Bali) whilst enjoying your delicious lunch. Further exploration takes us to the island of Nusa Lembongan, located to the west of Nusa Penida. Here we ll stop at Mangrove Point where we ll explore the mangrove forest using traditional boats. Enjoy the coolness of the atmosphere of the Mangrove Forest, and the sounds of animals you may have not seen before. It is also an excellent place to snorkel. After lunch we will return to Sanur and transport you to your hotel. Includes : Return Hotels Transport, Special Fast Boat fo Exploration, Traditional Boat for explore mangrove forest , Snack and Mineral water, Lunch, Young Coconut, Snorkeling Equipments, Guide/ Instructor, Bread, Towel, merchandise and Insurance.